Morihei Ueshiba (植芝 盛平 Ueshiba Morihei?, December 14, 1883 – April 26, 1969) was a martial artist and founder of the Japanese martial art of aikido. He is often referred to as “the founder” Kaiso (開祖?) or Ōsensei (大先生/翁先生? ), “Great Teacher”. 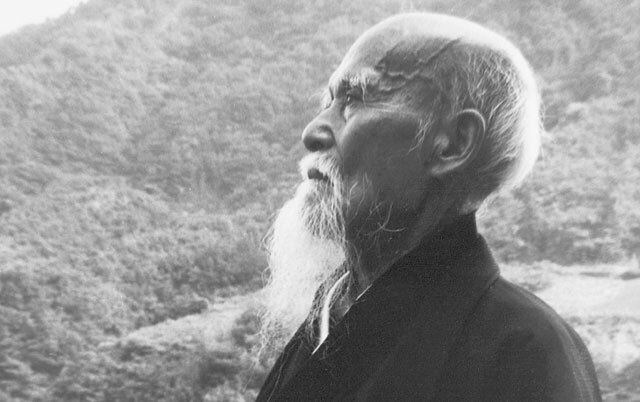 There are many legendary warrior archetypes, and the man who was Morihei Ueshiba lived them all. We was born a sickly child, and overcame his illness through strict martial training. He mastered many martial schools quickly. He became the unconventional swordsman that no master could defeat. He became a warrior ascetic, a spiritual hermit, who meditated on mountains and under waterfalls to achieve enlightenment. It was because he was all these things that the path he created and that which we practice today, Aikido, became something more than an art of fighting and struggle but a vision for harmony and the transformation of society. 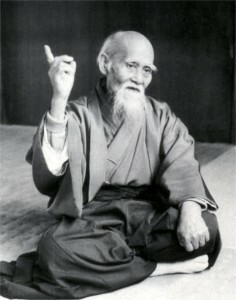 Today, most know of him as “O Sensei”, a title meaning “Great Teacher”. He was born in Tanabe, Wakayama Prefecture, Japan in 1883 during the Meiji Era (明治時代), a time of newly unified government but troubled change as Japan’s traditional culture, history, and government began to interface with the Western world. Fuedal era traditions were still strong, and there were many families and schools that still practiced traditional samurai arts 古流 (koryu). He became a figure of great renown who traveled the length and breadth of his country studying under the greatest masters of many arts. Hard work, severe discipline and all the money he could earn were poured into his mastery of the sword, the spear and the arts of self defense. Deeply interested in the study of spiritual thought, he had also practiced many different spiritual disciplines. Yet he was unable to unite his spiritual beliefs with his physical accomplishments. His personal experience in war, and watching his country change through post-World War II Allied occupation helped lead to a major change in his understanding and teaching of his warrior art. A short time after returning from military action in the Russo-Japanese War, he retired to a small house located on a mountain outside his village. There he lived and studied silently; his days spent training his body and his nights spent deep in prayer. It was at the end of this time of severe training that he had the realization he had been seeking all his life. At that moment nature’s process became clear and he knew that the source of 武道 Budo (the “Warrior Way”) is the spirit of protection of all things. 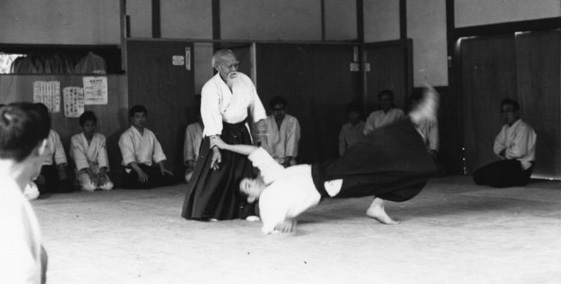 O Sensei’s experience in a changing world, experiencing the brutalities of war, and pursuit of spiritual reconciliation is what set the foundation for the path of Aikido, and what established a vision for Aikido as a path based on martial strength but whose purpose is for unification and not destruction. After his death, the government of Japan declared O Sensei to be a Sacred National Treasure of Japan. In much the same way, we revere his memory to remind us to transcend our conflicts, personal concerns and insecurities and strive toward building peaceful strength in ourselves and others. Portions of this page were excerpted from the ASU Student Handbook, 2001 edition.